For the first time since 2002 we were skiing and riding in November at Cranmore Mountain. Everything came together perfectly; the weather, snow making, and grooming. Special thanks goes out to the crew members who worked around the clock to make this possible. This allowed us to have 5 trails open with 2 lifts servicing the terrain. The conditions were great thanks to our 70 new snow guns, more efficient snow making system, and hardworking groomers. The New South Quad worked perfectly in its first day of operation and will be able to provide more than double the uphill capacity of the South Double it replaces. Both mornings saw beautiful corduroy being chopped up by those who descended the trails. Saturday saw wild flurries in the afternoon giving us a fresh blanket of snow. Sunday started and ended beautifully with blue bird skies ruling the day. The Mountain Coaster was also a hit with over a thousand riders hitting the 3,700 foot track. The lines were stretched through the zig-zagging netting, which means people must have been greatly enjoying themselves and letting others know about the wonderful experience. You could see pure joy on everyone's faces as they came zipping down into the lower helix and to the unloading platform. The mountain will be closed for the week while we make snow whenever conditions allow to add to the solid base we have built up. We're looking to open South Slope for next weekend giving skiers and riders yet another option to travel down the hill on. Lucky Loop should also see some jibs added to it this coming weekend when we'll be able to widen out the trail and make room for all users. The tubing park is also scheduled to open up so even more family fun can be had at the mountain. Cranmore has something going on for everyone! Stayed tuned at http://www.cranmore.com/ for the latest news and conditions. Thanks to all who came out and made opening weekend what it was. We look forward to seeing you again next weekend when mountain operations will start back up on Saturday, December 4th. Remember to think snow and Cranmore Mountain will be waiting for you! to make opening weekend possible! First, First Chair on the South Quad, quite an honor! Beautiful corduroy that unfortunately didn't last for long thanks to our guests! Sunday's skies were rather beautiful. Nothing like skiing in the warm sun! This group was itching to bomb down the mountain! Snow making continues at every moment possible to provide even better conditions for next weekend! Cranmore Mountain will be the place to be for family fun this Thanksgiving weekend, as the region’s first Mountain Coaster opens for regular operations after its successful grand opening this past Saturday. If mother nature cooperates, skiing and riding will also be happening starting Sat. Nov. 27th. The resort will also be hosting a Homecoming Event and offering special Thanksgiving weekend activities at its Fitness Center. Headlining the fun is Cranmore’s new Mountain Coaster, which will operate Friday to Sunday from 9am – 4pm. Tickets are just $9 per person per ride, or $23 for 3 rides per person. A special 6-pack is available for just $44, and tickets can be used by more than one person. 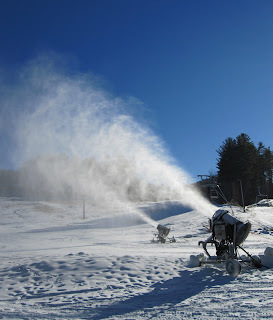 We began snowmaking on Friday November 19th and will continue as weather permits. Skiing and riding is projected to start November 27th and the Tubing Park will open on December 4th weather and conditions permitting. Opening weekend ski conditions would likely offer intermediate and advanced terrain off the summit. Also taking place is Cranmore’s first annual Homecoming Event, welcoming back season passholders and all other friends of Cranmore, on Saturday November 27th from 3-5pm in the new Artist Falls Lodge, home to the Cranmore Fitness Center and ticketing for the Mountain Coaster. The event will feature an overview by Cranmore president Ben Wilcox on the highlights of the resort’s on-going $6 million renaissance. Light refreshments will be provided and a cash beer and wine bar is available. The Homecoming Event will also feature a special sale of recently retired trail signs, for $50 each, with proceeds going to the Jimmy Mersereau Scholarship Fund. The Fund was founded last year in the wake of the passing of Cranmore’s long time mountain operations director Jimmy Mersereau and is in support of students interested in ski area operations as a career. The event is taking place at the new Artist Falls Deli, now offering visitors tasty favorites including pizza, beer, wine, snacks and soda in a venue handy to the new Coaster and expanded snow-tubing park. It will be open whenever the Coaster is operating, giving guests a new place to hang out for families enjoying the new attraction. Those looking for a fit and healthy option for the holiday weekend, Cranmore Family Fitness Center offers day passes for visitors to the Valley, only $12 for adults, $8 for seniors and $6 for children; kids 5 and under are free with a paying adult. Passholders receive 50% off for Sat. & Sun. 11/26-27 as part of the Homecoming event. On Thanksgiving Day, the Club is open from 7-11am and will be featuring its annual Turkey Day Spinning classes. Guests can sign up for a 7am, 8:10am or 9:15am class. Reservations are required as space is limited. Call 603-356-6301 for reservations. Rates are $8 for CFFC members and $10 for other guests. A special Turkey Buster class, an extended sculpt and tone work out, is available on Saturday, November 27th from 10-11:30am. There is no charge for CFFC members and anyone purchasing a day pass can take part at no additional cost. The Fitness Center is the largest facility of its kind in Mt. Washington Valley and offers a host of classes and programs all weekend long, with a full cardio and weight room available, plus indoor tennis and swimming pool. The Mountain Coaster opened to accolades last Saturday, with almost 400 people riding the new attraction. The Mountain Coaster is a year-round attraction that provides an exhilarating experience flying down the slopes of Cranmore, with views to Mount Washington and the Presidential Range. The ride features 2 person sleds that ride on stainless steel tubular rails. Each sled has its own hand brakes and the rider is in control of his or her speed at all times. To start, riders enjoy a 1200-foot trip up the mountain in the 2-person sled. Then the gravity-driven ride begins, taking people down the looping, turning track for 2400 feet down the slopes. The coaster will operate year round in nearly all weather. The Coaster is a centerpiece of a $6 million revitalization of Cranmore taking place under new ownership announced in June, 2010. The resort also installed a new quad chairlift, moved and expanded its popular snow-tubing park, renovated 5 facilities, cut new learning terrain, installed 70 new energy-efficient snowguns and relocated a double chairlift. Looking at Mt. Washington this afternoon lets us know that winter is on its way. The snow capped peaks are a reminder that we'll be back to our favorite activities in no time. I hope everyone is geared up and ready for what surely should be another great season. Test runs on the new Mountain Coaster went off as planned and is an experience no one should miss when it becomes fully operational in just a few weeks. A video will be up soon showcasing the ride and info can be found here - Mountain Coaster. Right next to the coaster is an upgraded tubing park that will have ten lanes to accommodate even more family fun. Our expanded ski school terrain looks great in the background as construction continues on the Arlberg Children's Center. Be sure to check back in as we approach our proposed opening day of November 26th, 2010! The expanded tubing park minus the snow...for now!